The grilled cheese sandwich is maybe one of the world’s most amazing culinary inventions, next to cheeseburgers and alcoholic beverages. And they can be made so many different ways, swapping out different breads and cheeses, adding extra ingredients like veggies or meat, though purists might argue that when you start adding anything you feel like it ceases to be a grilled cheese. I am of the school that believes the addition of one extra ingredient does not strip the sandwich of the grilled cheese title. Now for the prep. The secret to a good grilled cheese sandwich is patience. Use low heat and walk away for a few minutes. 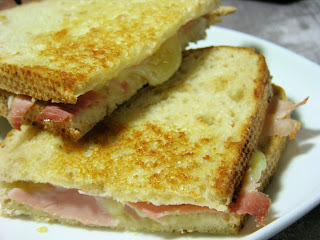 Heat the sandwich too fast and the outside will get brown before the cheese has properly melted. This is especially a problem if you're using a cheese other than good old yellow American slices. I personally like my bread to turn out golden, but not too brown. The outside should be lightly crisp and buttery, but soft after the initial crunch. The inside should be gooey and melty. Last, don't put the butter in the pan and put the bread in. Instead, put a few little pats of butter on the bread, then move the bread around on the hot pan to evenly distribute. 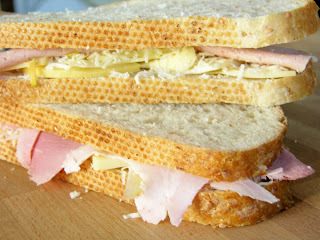 This will also save you some trouble when you flip the sandwich over. 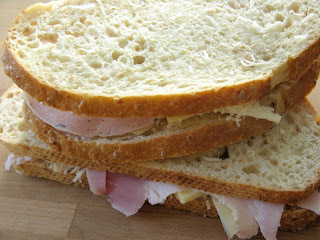 Assemble the sandwiches beforehand if you like and put in the fridge for later. Sandwich the slices of meat in between the two cheeses. 1. Pre-heat (on medium) a pan large enough to cook the sandwiches both at the same time. Put a few pats of butter on each of the sandwich bottoms. Place in the pan moving the sandwiches around so that all of the bread is coated with butter. Make sure you turn the heat down low immediately after the sammies are nestled in. Let them cook for about five-six minutes. 2. Flip them over, repeat. After a few minutes check the bottom to ensure it’s not getting too brown. Remove from pan after golden brown, cut in half. Enjoy cheesy, gooey goodness.